The Sea in Theresienstadt (Havet i Theresienstadt) was published 2011 in France by the Paris located publishing house, Presses de la Cité. 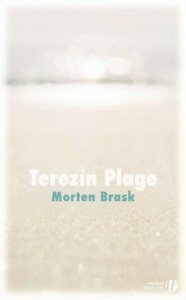 In French the novel is titled Terezin Plage, beautifully translated into the French by Caroline Berg. Even before its publication the novel was nominated to Prix du Roman Fnac and Prix Chapitre du roman Europeen. Terezin Plage has been well received in France and is now also distributed by the French Bookclub. In 2012 it was also sold the the French paperback publishing company POCKET. souviens de tout dans les moindres détails. L’escalier qui mène à la galerie et sa rampe étroite. vagues qui me font osciller d’avant en arrière, d’avant en arrière. répercute à travers les lattes du plancher et martèle ma colonne vertébrale. This site is the commercial website of writer Morten Brask. All text is copyrighted by Morten Brask.